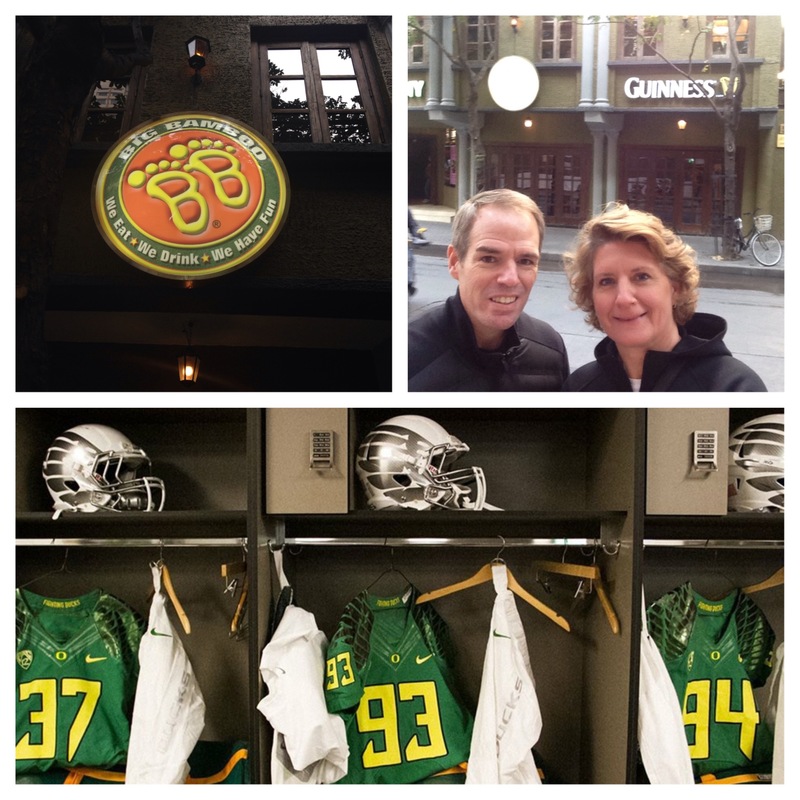 This past weekend, Greg and I walked over to the local bar, The Big Bamboo to watch the Duck game. Nothing like Saturday morning, 9am, in a sports bar. The bar stools were still up on the tables and the staff was just arriving. We approached someone and asked which screen would be showing the Duck game. “Duck?” Oh right. Sorry. I forgot where I was. “Which TV will be showing the Pac12 Championship game?” Nothing. Okay. Let’s take it up another level. “A-M-E-R-I-C-A-N F-O-O-T-B-A-L-L.” With a smile, he nodded and pointed to the main screen on the first floor of the bar. 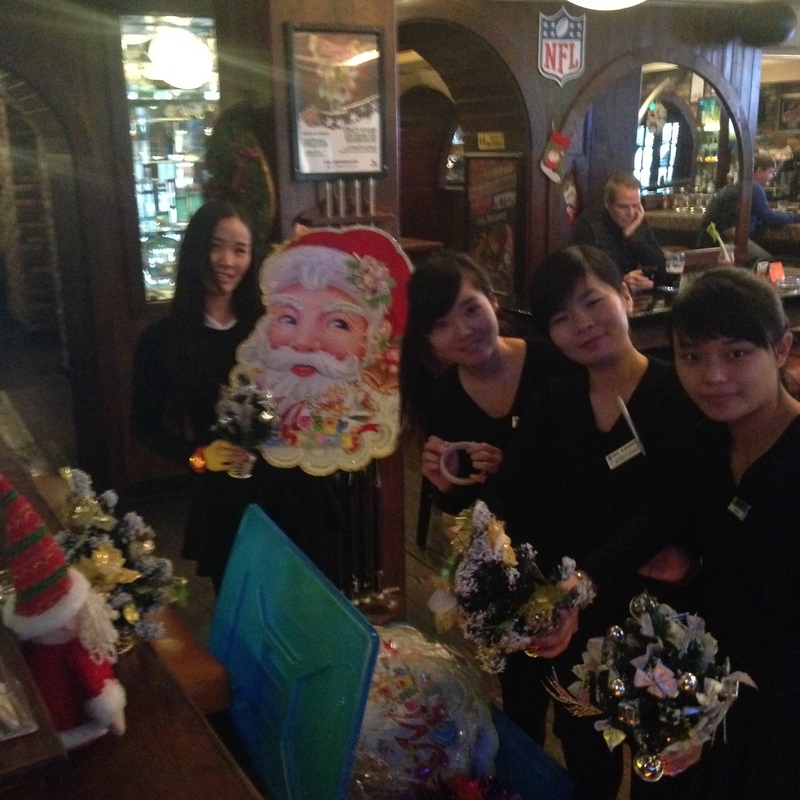 The staff was busy taking out Xmas decorations to put up for the season. Side note. Attending Catholic School in my youth, we were never allowed to use Xmas in any format. I was taught that it was taking the “Christ” out of Christmas. The word Xmas is used everywhere in Shanghai and I get a little nervous every time I see it and look over my shoulder for Sister Rose Delores and a ruler. As the game started, a couple more groups of people came in to the bar. The first two guys asked where they could watch the Arizona game. I directed them to the back room. We were having so much fun. Great coverage. No broken up plays due to the lack of broadband we often experience back at the apartment when watching from Slingbox, Xfinitity or ESPN to go. The guys from Arizona took to playing billiards. The staff continued to decorate and I could over hear Mr. USC talking about how they almost beat Utah. I chased this guy down right away as he entered the bar with this killer, UofO blazer. Turns out he’s the son of a ex-NIKE employee, an employee who worked for NIKE for 30+ years. I found out he lives in Shanghai working for Apple. His friend makes this fan wear suit for any team, any league, any program. As I’ve worked in the licensing business for years, I could have got all “legal” on him but didn’t. I did find out the location of the “tailor” so let me know your size and team and we’ll see what we can do! We ordered up more drinks and closer to halftime we ordered up some appetizers. Note to self, or anyone else planning to go to The Big Bamboo, stick with the sliders and fries. Not sure what part of the chicken is used when making the “chicken tenders.” Another note to self. Go easy on the Bloody Mary’s when starting at 10 in the morning. I went home and slept all afternoon. Great Saturday morning out on the town. Great win for the Ducks. Great fun trash talking the USC guy. By the way, the Arizona guys left the bar early, as did their team. Boom. When I got in the office on Monday morning, one of my Chinese co-workers who is also one of my Facebook friends, asked me where I got the Chinese characters for “Go Ducks.” I very proudly said “I typed it into Google Translate” He laughed and said it says “Go to hell. There is no translation for Go Ducks.” I sheepishly went back to my office to delete my post on Facebook. Clearly the programmer for Google Translate is a USC grad.